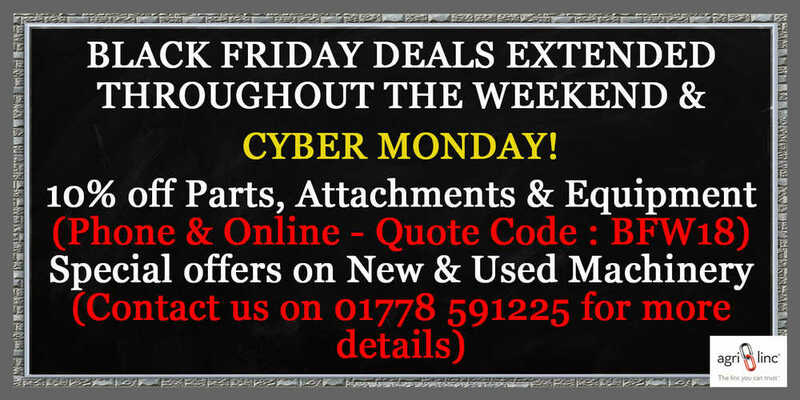 ** Agri-Days offers now extended to all customers over Black Friday Weekend and until Midnight Monday 26th. Special Offers on New & Used Machinery (Phone for more information)! Offers on New & Used Machinery revealed at the event. Event offers on Wearing Parts & Equipment - Visit our enlarged stores and attachments display area, displaying a wide range of stocked parts, equipment & workshop consumables. Proforge machinery demonstrations* including the New Proforge Mounted Multimole. EnduraMaxx Tanks will also be displayed at the event, featuring their rainwater harvesting and transport tank products. From the A151 turn in to Scottlethorpe Road and proceed approximately 1 mile. You will see Agri-linc, Randalls Farm on your right-hand side. Please follow us on Twitter and sign up to our email list to receive the latest information about the open days. *Demonstrations subject to weather conditions. Agri-Days offers now extended to all customers over Black Friday Weekend and until Midnight Monday 26th.